Hillfoot are key steel suppliers to the hydraulics industry. We supply blue chip hydraulic manufacturers and their sub-contract networks with raw material, semi-machined parts and fully-machined hydraulic assemblies. 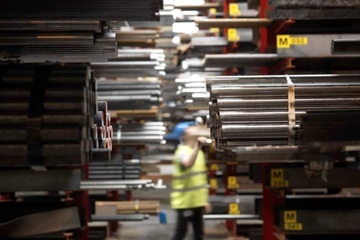 The steel orders we deliver range from hundreds of tonnes of product supplied for one-off projects to long-term agreements based on a number of needs and wants determined by both the customer and Hillfoot. We determine the most beneficial type of agreement and this all starts with the Future One process. Once these understandings are clear, we manage all aspects of the steel supply chain. This can be as straightforward as stocking an agreed volume of material to be called off in certain volumes, over an agreed period. It can also involve long-term agreements and fixing capacities with the raw material suppliers based on a number of different variables, such as line-side deliveries and consignment stock. As with any successful supply chain agreement the key is synchronising supply with demand. To make this work, Hillfoot is involved from the design stage which then enables us to manage the execution and controls needed to successfully deliver the job. This approach improves inventory visibility and movement, and as a result improves the trust and relationship with our supply partners. Contact Hillfoot for more information about our expertise in the hydraulics industry and to find out how it could benefit your business.